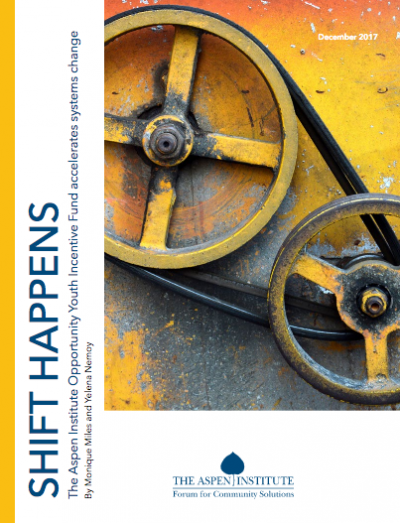 Our report, Shift Happens: The Opportunity Youth Incentive Fund Accelerates Systems Change, looks at the ways in which opportunity youth collaboratives from around the country have been removing barriers and improving systems to serve young adults and help them succeed. The Forum for Community Solutions’ Opportunity Youth Forum (formerly the Opportunity Youth Incentive Fund) works with cross-sector, cross-system collaborative initiatives across the U.S. that are focused on building and deepening the education and employment opportunities for opportunity youth, who are 16- to 24-year-olds who are out of work and school. "Indeed, more than 1 million opportunity youth are touched by the systems meant to serve them across the network of 24 communities. At the same time, emphasis on systems change has meant these strategies are implemented in a context of collaboration in which effective policy and practice changes can be scaled and sustained."